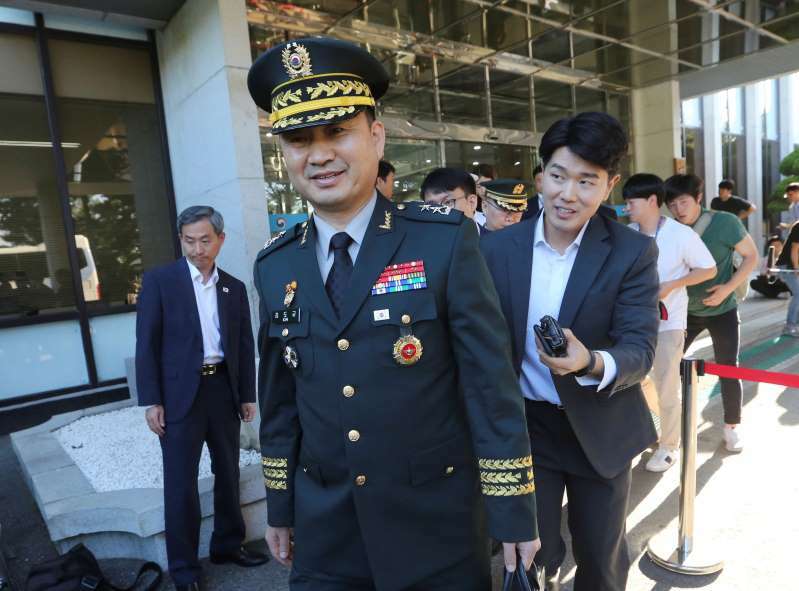 Generals from the rival Koreas met Tuesday at their shared border for talks meant to ease a decades-long military standoff, Seoul officials said. The meeting comes days after North Korea returned the reported remains of U.S. war dead, the most recent sign of blossoming diplomacy after last year's threats of war. The general-level officers were discussing ways to implement April's inter-Korean summit agreements on non-nuclear military issues, but no huge announcement is expected from the talks at the border village of Panmunjom. Some experts say South Korea can't agree on any drastic measures to reduce animosity unless the North takes serious nuclear disarmament steps. [post_ads]During the April 27 summit, the leaders of the Koreas agreed to disarm a jointly controlled area at Panmunjom, work to prevent accidental clashes along their disputed sea boundary and halt all hostile acts. Since then, the Koreas dismantled their frontline propaganda loudspeakers, restored a military hotline and held their first general-level talks since 2007. Tuesday is the second meeting of its kind since the summit. The generals will likely discuss dropping the number of military guards at Panmunjom, withdrawing heavy weapons from the area and pulling some army guard posts away from the Demilitarized Zone, a buffer zone that separates the two countries. They may also talk about ways to make sure their fishermen peacefully operate along the Korean sea boundary, the site of several bloody naval skirmishes in recent years. The Defense Ministry won't discuss any detailed agenda for the talks. The meeting comes four days after North Korea returned what were said to be dozens of remains of American soldiers missing from the 1950-53 Korean War, something that leader Kim Jong Un promised during a June summit with U.S. President Donald Trump. Trump thanked Kim for "fulfilling a promise" to send back U.S. remains and said it was a step in the right direction following their summit. During the Singapore meeting, Kim also committed to the denuclearization of the Korean Peninsula while Trump promised to provide him with security assurances. But there have been worries that North Korea hasn't since taken any serious disarmament measures. The North suspended its missile and nuclear tests and shut down its nuclear test site, and recent satellite photos indicated the country had also begun dismantling key facilities at its main rocket launch site. But many foreign experts say those were not enough to prove it's serious about its disarmament commitment, saying the North must first submit a list of nuclear assets to be dismantled. As a reward for returning the U.S. war dead, North Korea may demand that the United States agree on a declaration to end the Korean War as a U.S. security guarantee. That issue could be discussed at Tuesday's meeting, according to analyst Cho Han Bum at Seoul's Korea Institute for National Unification. The Korean War ended with an armistice, not a peace treaty, leaving the peninsula in a technical state of war. North Korea has long argued its nukes are aimed at coping with U.S. military threats, saying it wants to sign a peace treaty with the United States to formally end the war. That could then allow the North to demand the pullout of 28,500 U.S. troops deployed in South Korea.